This is the second part of solved quantitative problems for competitive exams. We are providing some important quantitative aptitudes to be quicker in math. Let's looks at some previous years of math problems and the easiest solution. Solution: We knew the travelled distance of upstream and downstream. We need the speed of upstream and downstream of the boat to execute the answer by shortcut formula. 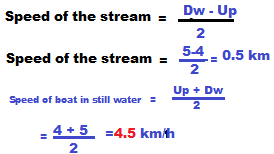 Upstream rate =24/6 =4 kmph. Answer: Look at below math tricks, how solved it quickly. Solution: here 1st no>2nd no>3rd no. 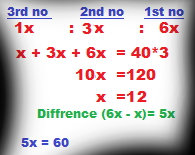 If we assume 1st no as x, then 2nd and 3rd number will be fractional numbers. To avoid that we assume the lowest number (3rd no) as x. let's look at the quick solution. Solved Math Question 5: The average score of a cricketer has 60 in ten innings. How many runs to be scored in the eleventh innings to raise the average score to 65? Solution: The average score of 10 innings is 60, means the batsman scored (60*10) =600 runs. As it will be (65*11) =715 after eleventh innings. So the batsman must be the score in eleventh innings (715-60) =115 runs. 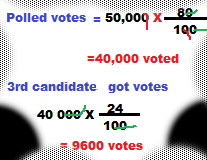 Solved Math Question 6: In an election, 80% of the voter has voted and three candidates contested. The first candidate got 30% votes and second got 46% votes. If the total number of registered voter were 50,000, then find the number of votes got by the 3rd candidate. All voters are not voted, only 80% voters are voted and fifty thousand of voter are registered. The 3rd candidates got votes 100-(30+46) =24%.